Below the name J Fogden on No 1 East Street is written Hairdresser and Tobacconist. In 1911 James Fogden, assisted by his wife Avis, is a tobacconist and hairdresser at 2 North St. 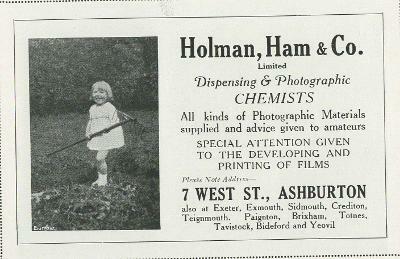 They were living in Portsmouth in 1901. James Fogden is in North Street* in Kelly's Directory of 1914, under Hair dressers. 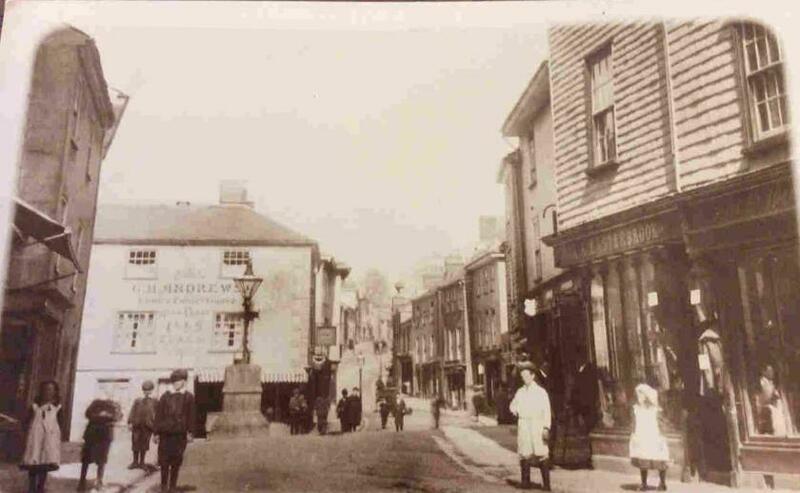 *The building in the picture is on the corner of East Street and North Street. The shop on the right hand side of the picture (No 9 West St) has J H Easterbrook written above it, plus Boot and Shoe Warehouse (probably). The 1911 census has John Henry Easterbrook living at Haytor House, West St., with his wife Nellie Mary. He is a tailor outfitter and boot dealer. 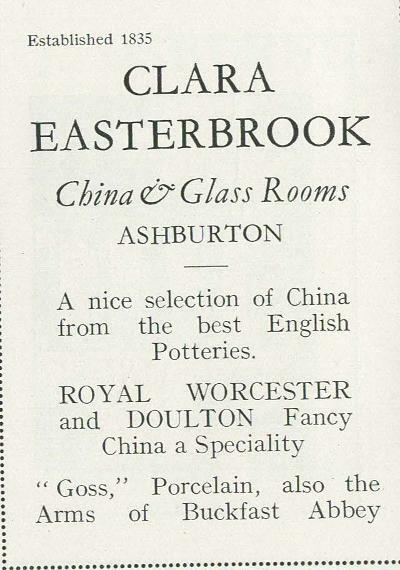 J H Easterbrook is in West Street in Kelly's Directory of 1914, under Boot and Shoe makers and dealers. 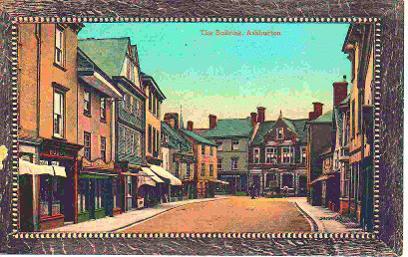 Above : North St., with Huddy's on the nearside left, with brown woodwork. In the 1901 census William Henry Huddy was a grocer in East St., with the elder of his two sons, 17 year old William Thomas Huddy, an apprentice. 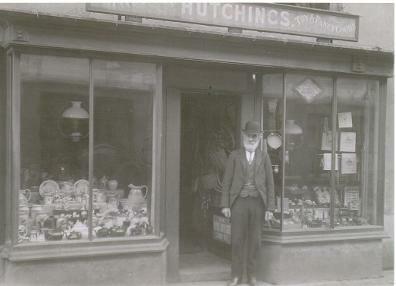 He is still in East St in 1911 - see the People and properties section. Many thanks to Linda Cameron both for the photograph, and for information below. 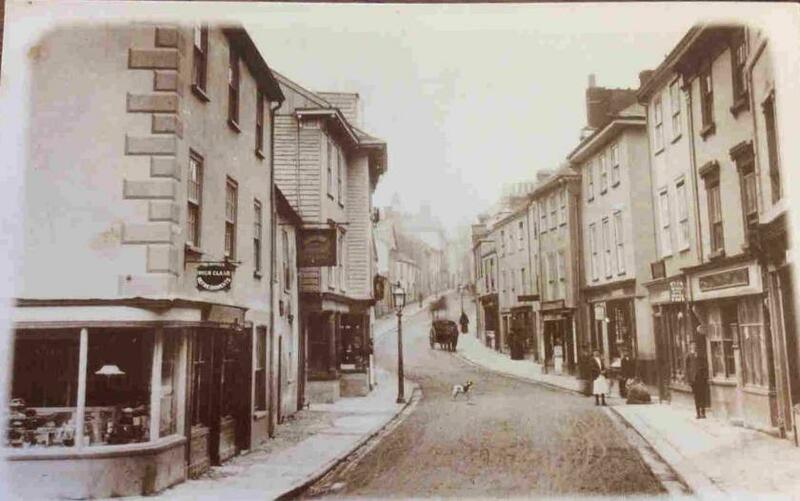 By 1891 the married 38 year old is living in North Street, but is employed as a gardener - according to family tradition, before they married both he and his wife worked at Waye House and Waye Farm. In 1911 he is still living in North St, on the eastern side of the road, roughly at No. 30 - see the People and properties section. This is possibly where the shop pictured above was situated. William H Hutchings died in the December Quarter of 1930, aged 77, and his death was registered in the Plymouth registration district. Above: The Bullring, showing G H Andrews at the corner of North and East Street. There were two ironmongers (hardware stores) and two saddlers’ shops, one of them, Charlie Eales, was situated in the centre of town next to Lloyds Bank (No 2 East St). There were numerous shops in the town: grocery shops were fascinating. Next to Andrews the baker was Mr Tape’s grocery shop - Mr Tape was a gentleman of rotund proportions who sang in the church choir. Mr Tape and Mr Edgecombe, the post master, changed their garb on Sundays for surplus and cassock, their deep voices and dignified bearing adding to the respect they already earned as businessmen. Between the Royal Oak and Andrews the baker was the Star Supply Store, but self respecting housewives scorned this modern innovation. Butter was cut from a large rectangular block, and butter pats shaped it into a perfect rectangle and embellished it with a final slap on top, leaving a cow, floral pattern or some other rural reminder of its origins. My mother was horrified when I suggested that we had butter with a cow on top, “We eat Stanbury’s from Summerhill Farm, not that New Zealand stuff!” she replied. A printer’s shop occupied a site opposite Tape the grocer in East Street and higher up was a butcher’s. It was the practice for animals to be slaughtered by the butcher or a man employed for this purpose in the field now occupied by the new primary school which was used for rearing pigs. Here once a week the horrific agonising sounds of pigs being killed was distressing to small children. Farmers’ sons adopted a pragmatic approach and one was heard to remark “You likes bacon, dowt ee”. There were several butchers’ shops. Beside the usual beef, pork and lamb a variety of offal was sold. Liver, kidneys, hogs pudding and chitterlings, brains and the may bag, which, I believe was the animal’s stomach. Tripe was also on display, honeycomb and black being two of the varieties. Pigs’ trotters were popular and strings of sausages hung from hooks as well as pigs’ heads, tripe and rabbits. Poultry was rare; it was considered a luxury and reserved for Christmas when feathered geese, ducks and chicken hung outside the shop well above the reach of passersby. Turkeys were considered beyond the pocket of ordinary people and were not usually in evidence, although gleenies, the local name for guinea fowl, and pheasants and geese were also popular. Above the butcher was a haberdashers and wool shop, run by Mrs Mugridge, a short stout woman who appeared with a broad smile to greet her customers. Her husband worked as a postman, a tall broad shouldered man who dwarfed his wife. To me they appeared to have stepped straight out of one of Dicken’s novels. Mr Mugridge was known locally as ‘Billy Mug'. Higher up on the opposite side was Sam Eales' establishment. He must have sold other goods, but as far as I know he was the provider of paraffin. This was ordered on a Friday and to go into the little low ceilinged store was like entering a cave. It was dark and smelt of oil and age. The owner had an extremely red complexion. He delivered the paraffin on a Saturday morning in a rundown van and the oil was poured into the housewife's can from a tap on the door of the van. A funnel was placed in the can and woe betide him if he spilt any oil of the freshly washed pavement. I watched hoping for some spillage as the complaints from the housewives fascinated me. Some people still used oil lamps, though gas was considered to be the ultimate modern form of lighting. Paraffin fuelled Valour stoves which heated many bedrooms, including our own, in winter casting fascinating patterns on the ceiling. The next morning the windows bore evidence of Jack Frost's visit during the night. Delightful pictures appeared as if by magic. Almost opposite Greylands (48 East St) was Miss Knapman's shop. 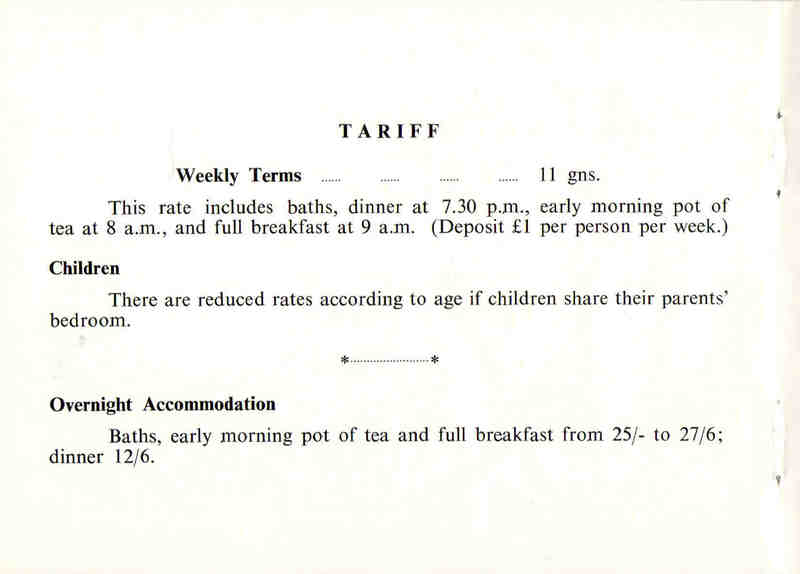 Mrs Knapman sold sweets and a small assortment of groceries in her front room, not uncommon in the twenties. Almost opposite the Post Office in Station Road, now St Lawrence Lane, was a little grocery store run by Mrs Bessie Daw. She had inherited this from her mother, so it was a well-established business; she specialised in cheese. The shelves were well stocked with goods - Vinolia soap jostled with carbolic soap and bags of washing soda. Sides of bacon hung from hooks in the ceiling and many an unwary customer received a clout on the head. Tins of salmon stood alongside canned fruit, jams and pickles. Sacks of sugar stood on the floor together with dried fruit and the dreaded prunes, which we children hated. On a round table, in pride of place was a huge Cheddar Cheese, a speciality of the store. Wire cutters resided on top and a large triangular wedge would be carefully wrapped and weighed on brass scales with shiny polished weights, which ranged from a large two pound weight to a tiny one gram. A wire basket containing eggs was in the window. Eggs and butter fluctuated in price weekly according to Newton Market prices. There were shops in the lower part of North Street. Two large draper's shops: Osborne's next to the Paper Shop and Cubit's. Osborne's stocked clothes and household items. Bentwood chairs with long legs stood by the counter, and restless and unruly children were planted on the chair while the proprietor, a small spruce man, served his customer. Mr Osborne had two daughters, Ella and Madeline, who were considered to be young ladies and would have considered it demeaning to serve in their father's shop. One however was Brown Owl of the local Brownie pack. 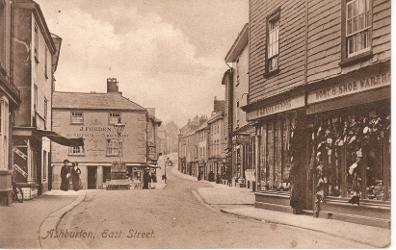 Above: North Street, circa early 20th century. On the original, the advertisement on the side of No. 8 (fourth building from the right) reads Osborne's draper and outfitting (or outfitters) store. Below: A view further up North Street. 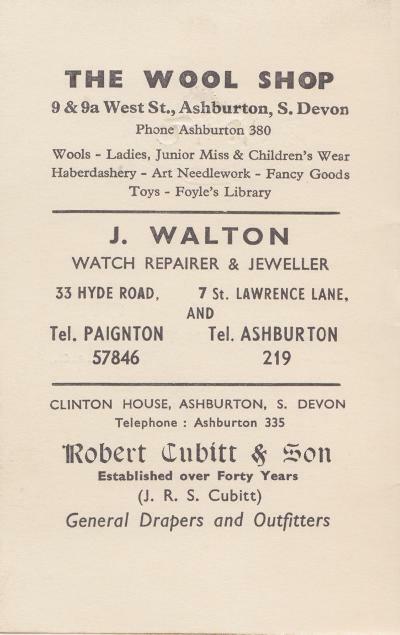 Cubit's was a larger store, with hats and lady's dresses on the first floor. Part of the ground floor was reserved for men's clothes. A yard rule was inserted in the counter for measuring ribbons, laces, furnishing fabrics and dress material. Mr Cubit was a genial gentleman and a good businessman. Both stores stocked rolls of linoleum and canvas for floor coverings - coconut matting was also available. Both ran a clothing club, and people who could afford to paid a shilling or more a week. The club 'came out' in May and October and a bonus was added to the total. Wages were low and many people lived and died in poverty. Boon’s the hardware shop was a fascinating place for men to browse in. * Low ceilinged and dark, it supplied all the requirements for the handyman. Further up North Street was another hardware shop and another saddler’s shop. 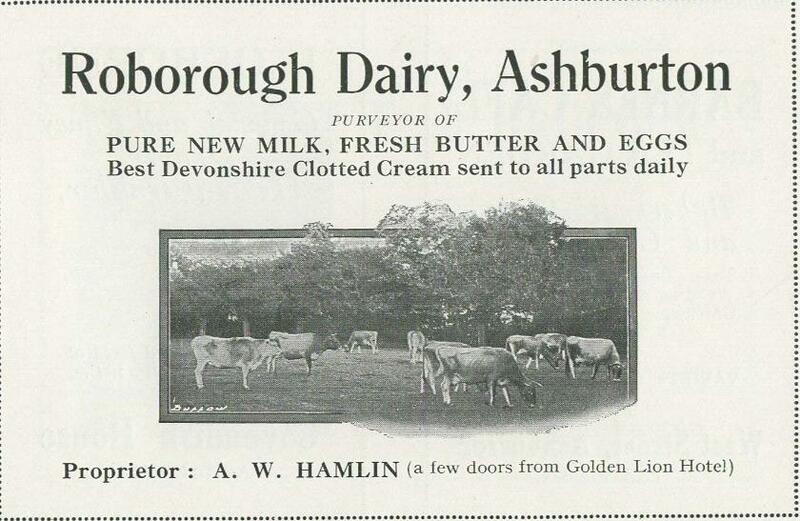 On the opposite side by Kingsbridge Lane was Bonstows Dairy selling butter, eggs and cream. A large bowl of clotted cream held pride of place in the window. Customers took a bowl or glass dish; this was weighed and then the required amount of the delectable product was carefully measured. A piece of greaseproof paper was placed over the top. All the produce was from local farmers, customers always wanted to know the source of their goods. 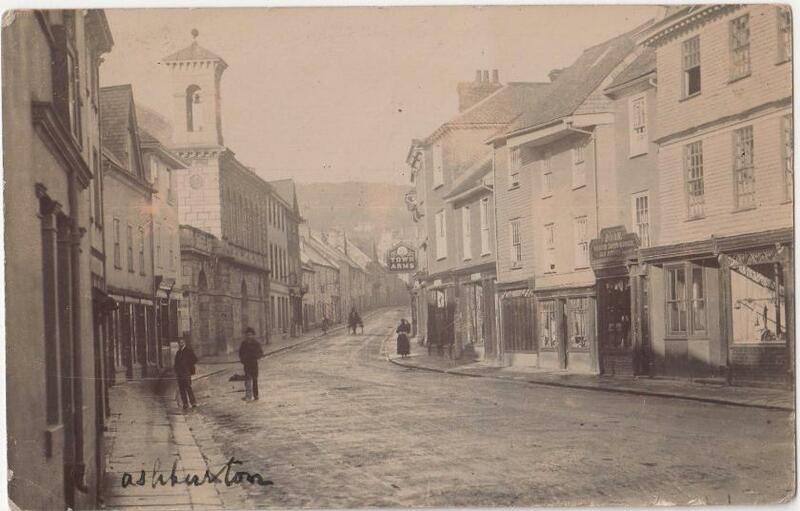 At the top of North Street on Great Bridge, Harold Hatch worked in the wheelwright’s premises. Water was readily available for immersing the wheels, and the age old craft provided interest for passersby. He was a tall slim man, meticulously tidy and his premises were a treasure trove of the tools of his trade. They hung on walls and were a museum of his craft. With his demise everything disappeared. For some years, it became a garage and filling station. 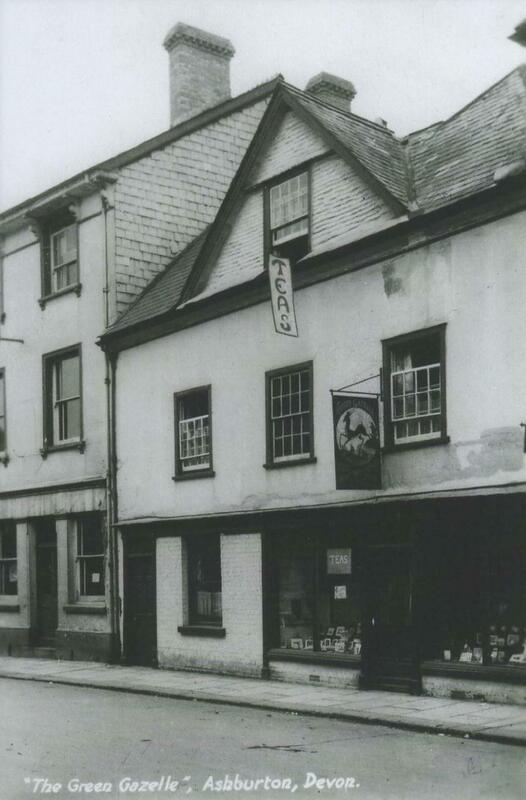 Mr Huddy's store was at 16 North Street. The grocers themselves all seemed to be larger than life and pillars of the town. 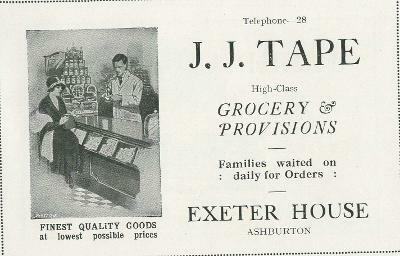 Grocery assistants weighed produce and deftly closed the tops of the blue bags securely, and at Down and Beers fancy biscuits were displayed in glass cases - you selected your favourites which were then put in a bag and weighed – the world of supermarkets and packaged goods undreamt of. Down and Beer and Mr Huddy went to the chapel 'dissenters' as my mother persisted in calling them. Many thanks to Hazel Bray for the account above. * This may have been Horace Boon, whose funeral was reported in 1929 . 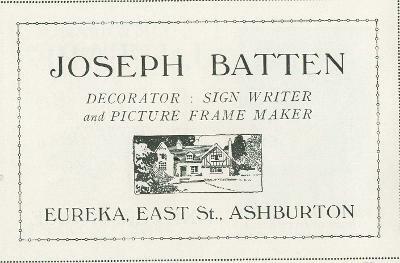 Described as highly respected, he had been in business up until about 1926. A Wesleyan, he had been a Sunday school teacher and at one time a member of the Fire Brigade. 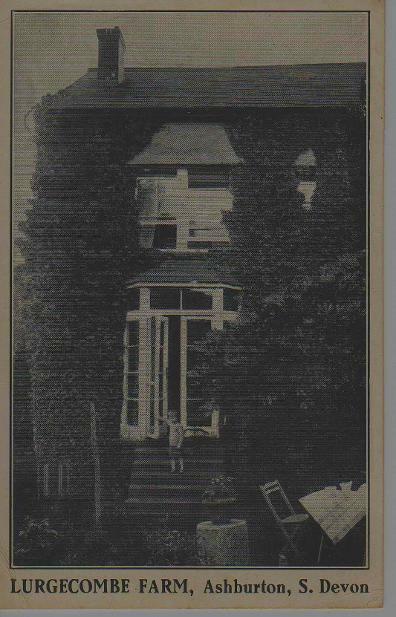 In 1923 Rendell and Sawdye offered No 33 North Street for sale. 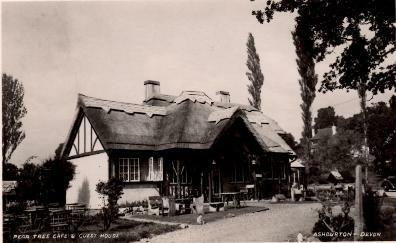 Occupied by Mrs Binmore, it comprised a house, shop and bakery. In 1905 there were some side shows at a YMCA jumble sale at Buckfastleigh. 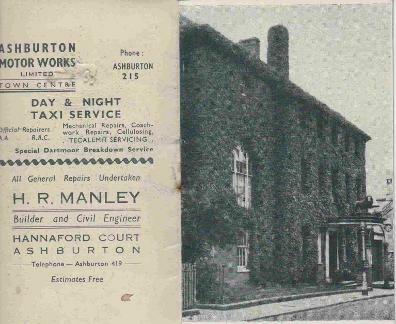 Mr Lewis Arscott was in charge of one of them - he 'did business with an electrical battery'. 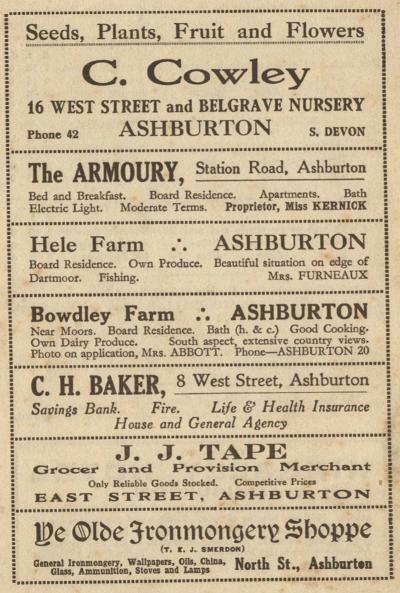 At the time of the 1911 census he was 27 years old, living with his parents in Buckfastleigh. He was a builder's clerk. 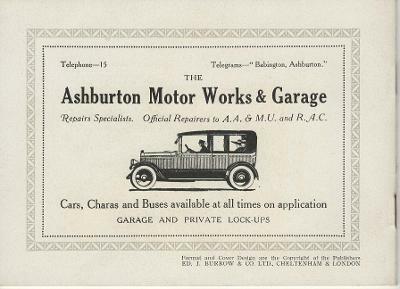 In 1927 Lewis Arscott gave evidence after two cars collided in Ashburton. He was described as an engineer. 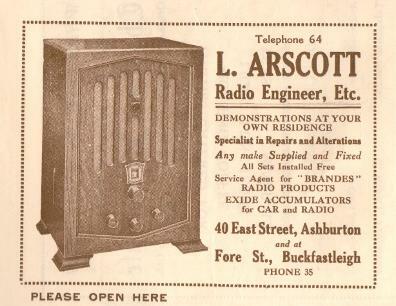 L Arscott, Radio Engineer, was at 40 East St sometime in the early 1930s. He did repairs, and supplied accumulators. Lewis Arscott was 'of East Street' when he was summoned for using a vehicle without a licence in 1937. The rag and bone man made regular visits, much to the delight of the children – a bundle of old clothes would be exchanged for a goldfish, or maybe two, the recipient having produced a jamjar of water. Some poor fish were killed with kindness, but others lived for a year or so, and proud owners of a goldfish bowl displayed the fish forever circling the confines of its globe. Eventually someone deemed these bowls not suitable for the fish to swim in, so tanks became substitutes: hopefully goldfish appreciated the change. Welcome itinerant traders were the French onion boys, who came annually to the town. In their distinctive striped jumpers and familiar berets, they arrived on bicycles with the string of onions hung in a picturesque style over the handlebars. They spoke little English and local people had no knowledge of French, but transactions were made and many kitchens proudly displayed their onions from Brittany, dwindling week by week. A knife sharpener would appear periodically pushing a trolley and working a wheel which caused a circular stone to revolve. Knives and scissors were produced and the skilled hands of the operator would thumb the blade to be sure he'd done a good job. The booklet is undated but probably comes from the late 1920s: information within it says that Buckfast Abbey was not yet completed, but had been dedicated for worship in 1922. 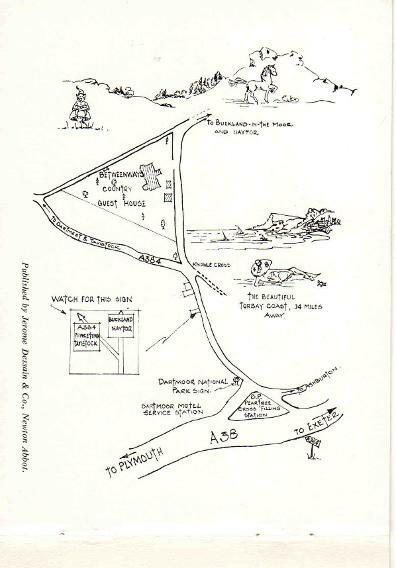 The town was not yet bypassed - the bypass was proposed in 1930. H W Chard, a watchmaker, also advertised in the booklet. 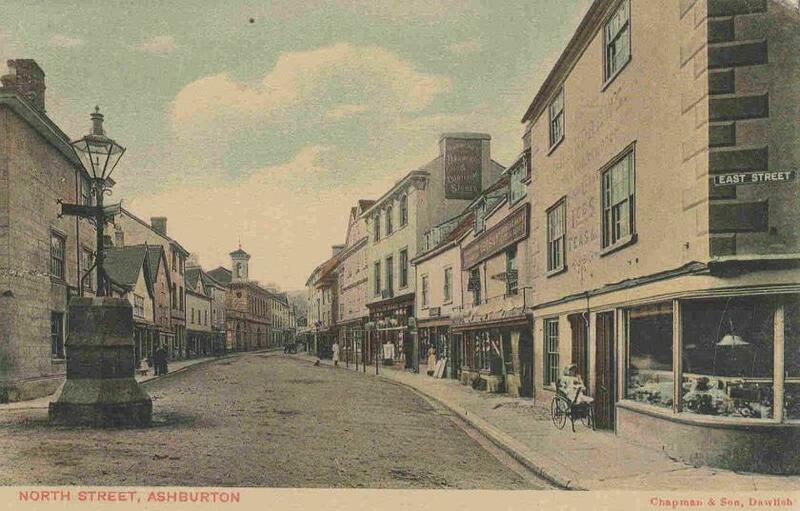 He was on the electoral register for Honiton in 1922, but by 1923 was in Ashburton. 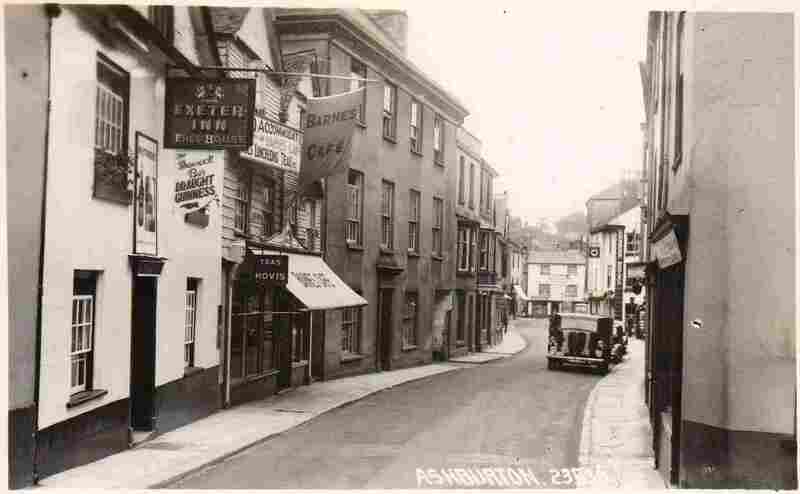 He was still in Ashburton in 1929, but by 1931 had returned to Honiton. For more on H W Chard, see Clocks and Clockmakers, under Banks and Businesses 2. C H Baker, 8 West St, Savings Bank, Insurance Agency. Ye Olde Ironmongery Shoppe, T E J Smerdon, North St.
1939 The death was announced of John Henry Day, who had been a baker and confectioner at 9, East Street, for the previous four years. He had taken over the business from the late G. H. Andrews. 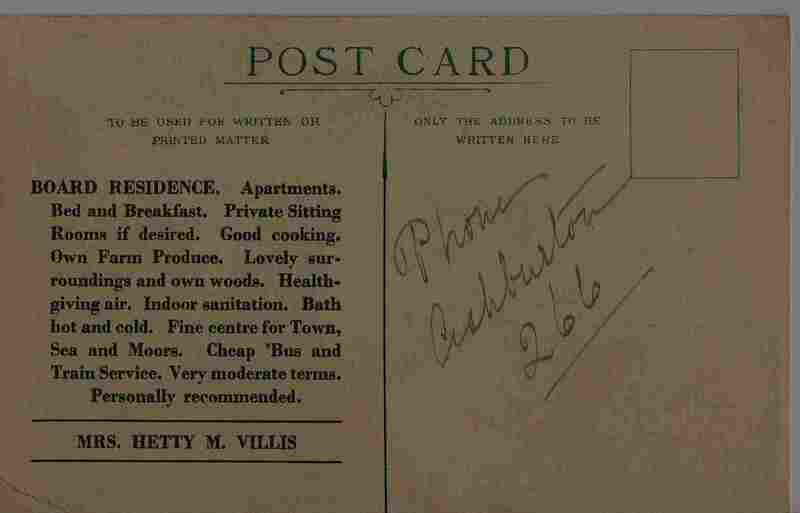 Left and below: A postcard advertising Lurgecombe Farm, owned by Mrs. Hetty M. Villis. 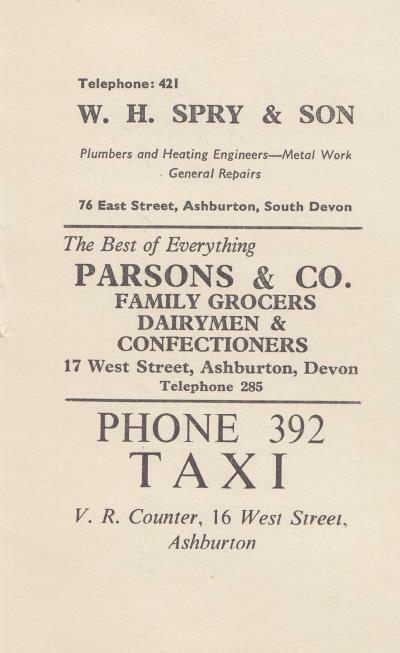 The phone book from at least 1942 onwards confirms the telephone number as 266. Hetty died in the March quarter of 1956, aged 87, in the Newton Abbot registration district. 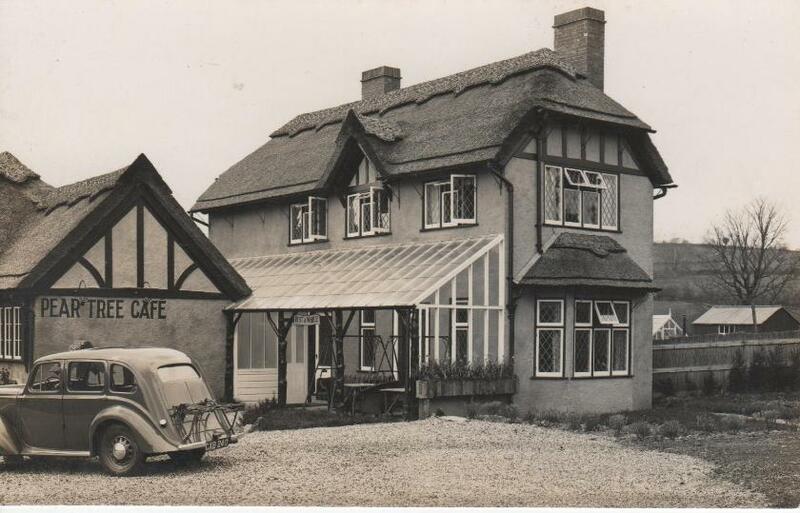 In 1948 a fire occurred at the Pear Tree Cross Cafe, owned by Mr and Mrs G A Pearse. A motorist spotted flames in the thatched roof, and a 'fresh breeze' enabled the fire to take hold. 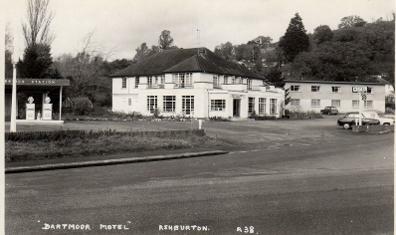 In spite of the efforts of the Ashburton and Newton Abbot brigades, the cafe was completely destroyed. Many residents and motorists helped salvage furniture and goods from the building. Left: The motel, rebuilt on the site. 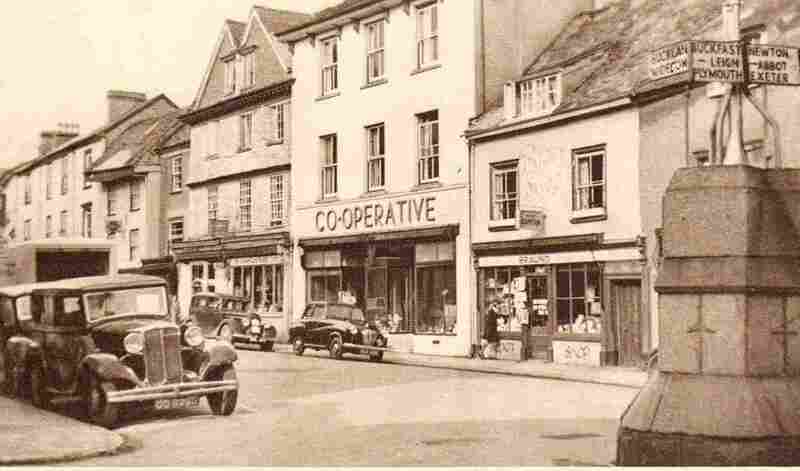 In 1955, the Co-op had departments at nos. 8,19, 30 and 32 North St. The drapery department was at no 8, and the regional office was at no 19. The item on Webbers and Christophers has now moved to Building Contractors, under Banks and Businesses. 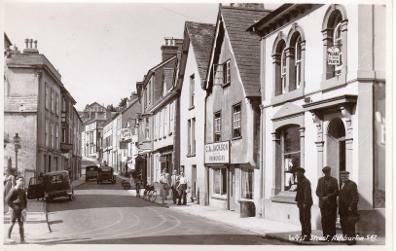 Left: West Street, 1940s or 50s ? The property second from the right, No.12, has the sign C A Jackson, Fishmongers. Further up on the right the sign protruding from the building says Barnes Café. H J Parnell, High class baker and confectioner. East Street. Phone 365. Streeton, Newsagent, bookseller, stationer. North Street. Bolloms dry cleaning. 22 North Street. Sawdye and Harris, Auctioneers, agricultural valuers and surveyors, estate agents. Tel 304. Monthly sales of all stock at Ashburton market. Right: Page from the Golden Lion booklet. See the Virtual museum 1950s section for more images. 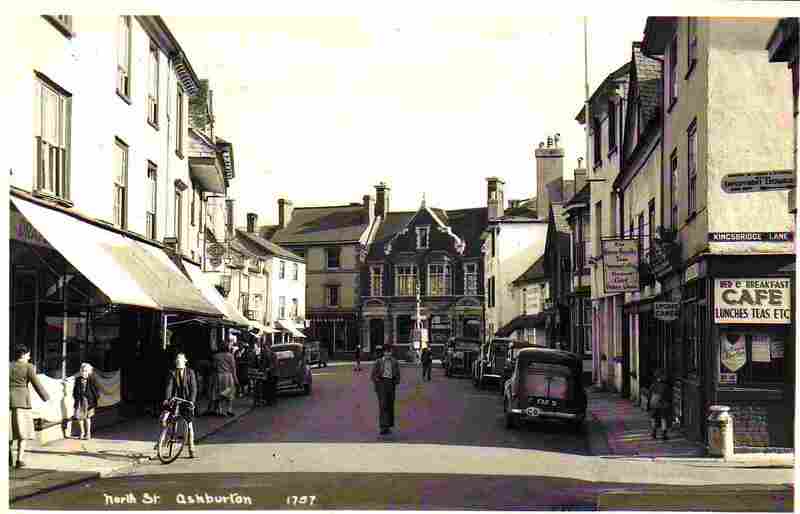 Left: North Street, the 1950s. The Green Gazelle Café is on the right hand side of the photograph, (with a protruding sign), the next one along from the café on the corner with Kingsbridge Lane. The item on Webbers and Christophers has now moved to Building Contractors, a sub-menu of Banks and Businesses. 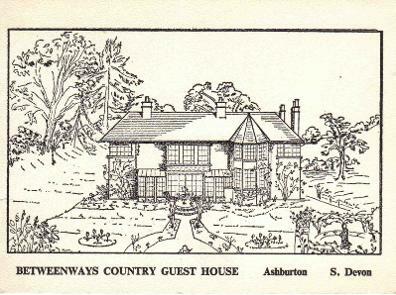 Betweenways, the home of the Foaden family in 1938 and before*, was a county guest house by about the 1960s. 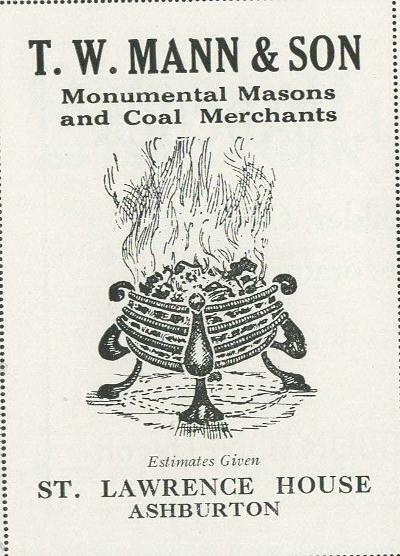 Mr and Mrs T D White were running it at the time of this booklet. Later it was renamed the Grasshopper (1970s - my own recollection); later still Lanterns. It is now (2016) the Lavender House Hotel. The Wool Shop, wools, haberdashery, toys, Foyle's librday, 9 and 9a West St.
W H Spry and Son, plumbers and heating engineers, 76, East St.
Parsons and Co., grocers, dairymen and confectioners, 17 West St. 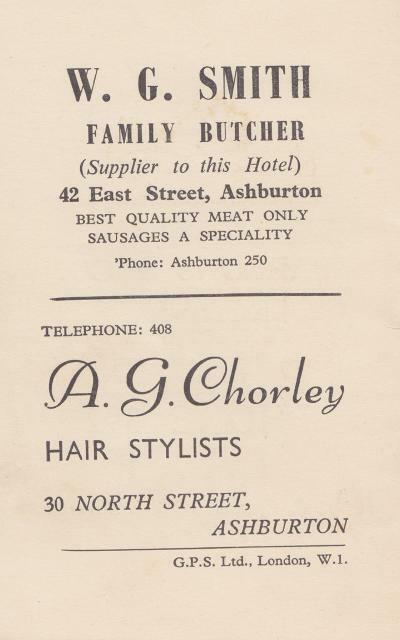 Taxi, V R Counter, 16 West St.
W G Smith, butchers, 42 East St.
A G Chorley, hair stylists, 30 North St.